I love a good review game. I had a hard time coming up with My Favorite for the #MTBoS blogging initiative because I have so many favorites. I have a lot of review games in my inventory and I give some thought to which one to use when. This week we were reviewing for midterms next week. It was a good time to do a mix of difficult problems from the entire term. With ZAP, I use 16 questions and put them into a powerpoint to project. The kids work in their classroom groups and each has a white board. They hold up their answers and the first person to answer wins 5 points for their group. It does involve speed and competition but it gets us to move through 16 problems in the class period. Even after the first person gets it, I give the other kids more time to work and hold up and check their answers. If they are still stuck, we will go over it. The ZAP board helps adjust scores so it isn't always the fastest or smartest team winning. There are some good ZAP cards (multiply your score by 2) but there are also some bad cards - ZAP your score (revert to zero). It keeps the kids engaged. They work in groups and help each other. I bought library pockets online and made my pretty board: Just write on the index cards and add them to the pockets. The correct team earns 5 points and then picks a number. There are positive and negative plus two silly things - stand up and sing "I'm a Little Teapot" and "do 10 jumping jacks". You have some great activities posted in your blog. 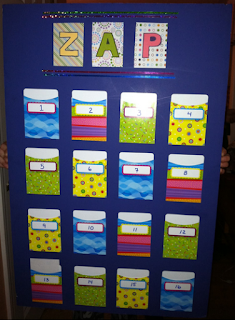 This seems like a great quick activity to put together now that you have your ZAP board set up. Sounds like a really cute idea! I'll have to give it a try sometime. Review games can seem so stagnant sometimes. Thanks for sharing! Very cool idea! I love the look of your ZAP board! Fun way to review!.. Love the element of surprise in letting the kids chose a # for their prize and the results (singing) that follow.